The 34-person slate proposed by CORE (the Caucus Of Rank-and-file Educators) swept all 34 seats for retiree delegates to the 800-member Chicago Teachers Union House of Delegates. The voting, which began in December, ended in January, and the votes were counted on Saturday, January 24, 2015, at the union's offices by members of the union's Rules-Elections Committee. 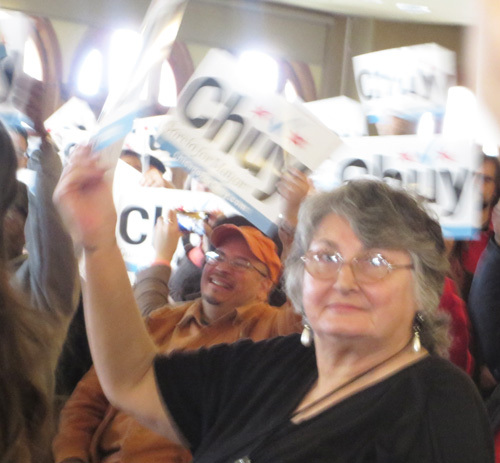 One of the 34 CORE candidates elected to the CTU House of Delegates for the three-year term beginning January 2015 is Theresa Daniels (above at the January 24 PUSH rally for Chuy). Like most of the CORE candidates, she served for decades as a union delegate from the school where she taught (Carver Area High School, before it became "Carver Military Academy"). Substance photo by Jean Schwab.A total of 35 delegates were being elected, and the eventual CORE slate consisted of 34 union leaders. The 35th person elected was Mary Sharon Reilly, who currently also serves as "functional vice president" on the CTU executive board. (Disclosure: This reporter was a candidate on the CORE slate). Seventy candidates were running in the election for the 35 seats, who will serve three year terms in the union's 800-member House of delegates. Under the constitution and by-laws of the CTU, union teachers elect delegates from the schools at the rate of a first delegate for each 20 members and an additional "associate delegate" for each additional 40 teacher members in the schools. Elections for school teacher delegates are held in the schools. Other groups in the CTU (school clerks, clinicians, etc.) also elect delegates at the rate of one for 40 members. Like the retiree delegates, delegate elections for other groups are held by mail ballot. Retiree delegates are elected at the rate of one delegate for each 100 retiree members, a difference with all other groups in the union. Because the union has 3,500 retiree members the election would result in 35 delegates for the retiree functional group. Best wishes to all winners. Wish I could be back on the House of Delegates Floor again. The only thing I miss while living in Florida is Substance & the CTU. Keep your eyes on the pension laws. I thank all the retirees who voted, especially those who got me elected as retiree delegate once more. I wish all the worthy retirees who were candidates could have become delegates. We have so many wonderful retirees (and active teachers who are the retirees of the future)in our proud union, the Chicago Teachers Union, third largest in the nation. Yay, us! We're doing good!